With no additives, zero carbs and no refrigeration required, Swiss made Tiger Gruyere is an excellent cheese for on-the-go lifestyles, but equally delicious when enjoyed leisurely or for entertaining. Each petite, individually portioned wedge is made with the finest raw materials and comes in an easy-to-open, brightly colored foil wrapping that is both practical and fun. Tiger Gruyere’s firm texture better maintains the integrity of its shape for transport while delivering a delightfully smooth mouth-feel and a pleasant, full-flavored nuttiness. Available in plain, Alpine Herbs and Smoked flavors, Tiger Swiss Gruyere appeals to wide range of palates, from children to adults. Applications: Perfect for grab-and-go moments, serving at parties or as a snack. Tiger Gruyere’s attractive packaging and long, shelf-stabilized life also makes it a perfect addition to gift baskets. Pairing: Remarkably versatile to pair, Gruyere goes well with a number of white and red wines. Great pairings would be Pinot Noir or Chardonnay. Avoid high alcohol New World reds like Zinfandel and Shiraz that would be overpowering. 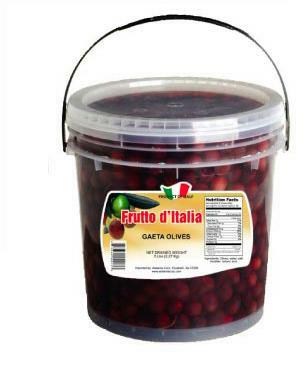 Splendid well beyond table olive/cheese accompaniment enjoyment, Gaetas add an exceptionally pleasing taste to salads and pasta dishes, as a meat and fish topping, or when pureed for dressings and sauces.